In 1902, Beatrix Potter wrote a children's book called The Tale Peter Rabbit. Originally written for then five-year-old Noel Moore, who was the son of Potter's former governess, the story centers around a group of anthropomorphic rabbits known for causing mischief in the garden of a man by the name of Mr. McGregor. Wildly successful, this book has since been translated into 36 languages and has sold over 45 million copies, making it one of the best-selling books of all time. Sony Pictures, along with director Will Gluck, have adapted this beloved tale into their latest animated feature film. 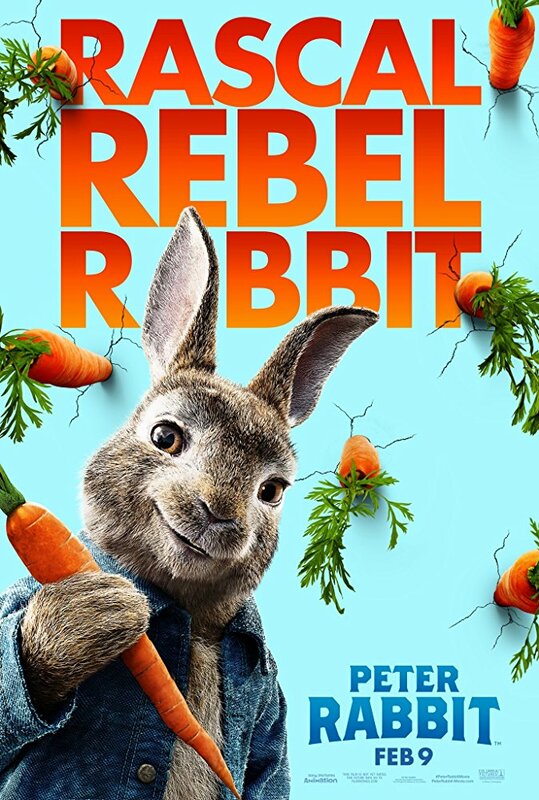 Peter Rabbit begins with Peter (James Corden), his sisters, Flopsy (Margot Robbie), Mopsy (Elizabeth Debicki) and Cotton Tail (Daisy Ridley) and their cousin Benjamin (Colin Moody) planning a raid on Mr. McGregor's vegetable garden. Although, initially portrayed as just a bit of fun on the part of Peter, we learn the real motivation behind their continued obsession with the McGregor Garden is that it's the ancestral land of Peter and his family. The writing in Peter Rabbit is almost exclusively for children. The jokes are simple and reinforced through the heavy use of slapstick humor. Domhnall Gleeson's execution of these gags lies somewhere between Chaplin and Home Alone and had every single child in the theater doubling over in laughter. Although this tale is light on underlying adult humor, which has become a signature of Pixar animated films, Peter Rabbit, with it's central theme surrounding the idea of land ownership, is a powerful statement on human entitlement. Since the death of their parents, the orphaned rabbits have been under the care of Mr. McGregor's neighbor Bea. Played by actress Rose Byrne, who charmingly repeats this concept as she continually comes to the aid of Peter and his family throughout the film. The film is successful in garnering the sympathy from the audience on the behalf of the rabbits, using language easy enough for small children to understand. The animation of Peter Rabbit is impressive. Peter and his family look almost lifelike with excruciating attention to detail given to all of the animated characters features. The action sequences are flawlessly executed between the animated and non-animated elements of this film, never leaving a moment for you to realize you are looking at a human actor interacting with green screened characters. Overall, Peter Rabbit is a bit on the overly sentimental side. I may need to have no less than six cavities filled after seeing this film. There are some darker topics covered in the film that were handled with Doodlebops style care. This lack of balance detracts from the powerful message Peter Rabbit has for it's audience. However, this film did seem to be aware of this, as there are several moments when it attempts to make fun of itself. If you are a parent of young children who is looking for a film made exclusively for them, I would highly recommend taking them to see Peter Rabbit.